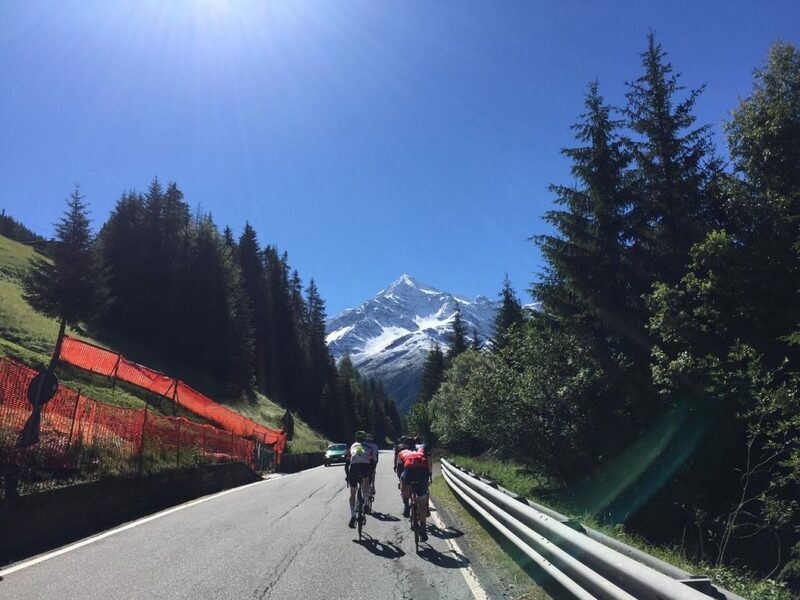 At the end of June six OUCC riders finally decided reps of Brill hill were not enough to quench their climbing thirst and that the mountains near Bormio in Italy were calling. 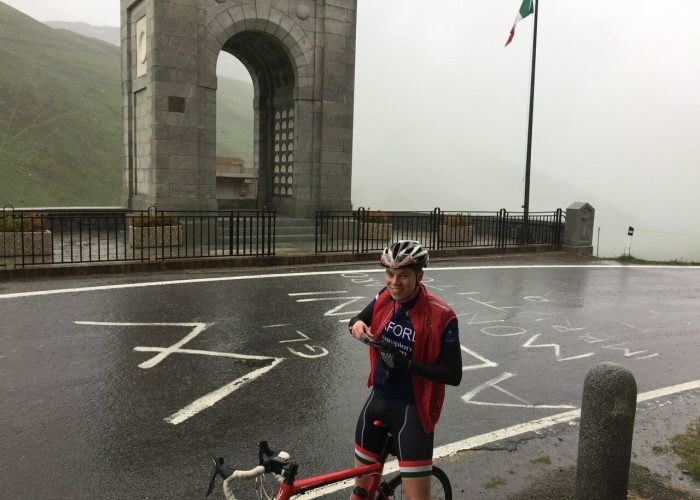 This was our chance to ride some of Europe’s highest roads and climbs made famous by the Giro d’Italia. 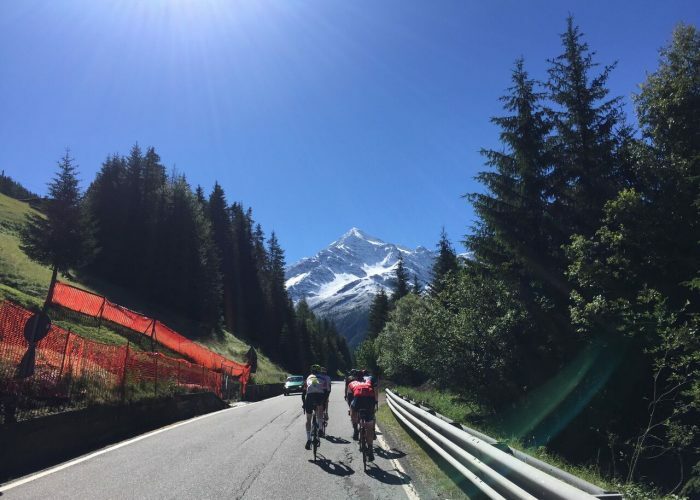 The first day would be the 130km ‘super loop’, a route taking us into Switzerland via Livigno and the Passo Foscagno. Joe came into the trip in great form and proved this going clear with VJ on the first climb. 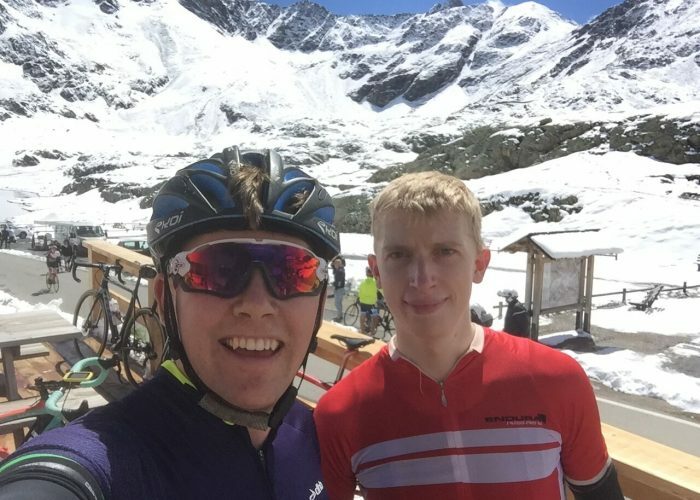 After regrouping it was then up to Josh and Sam to lead the way on the descents, reaching speeds in excess of 100km/h down the Bernina Pass. On the way down Mat was descending on rails, quite literally, after crashing due to some unmarked railway tracks. Luckily this wasn’t at full tilt and he got away mostly unscathed. Day two and the weather took a turn. Every trip has a prevailing theme and this trip’s would be the weather, it seemed. 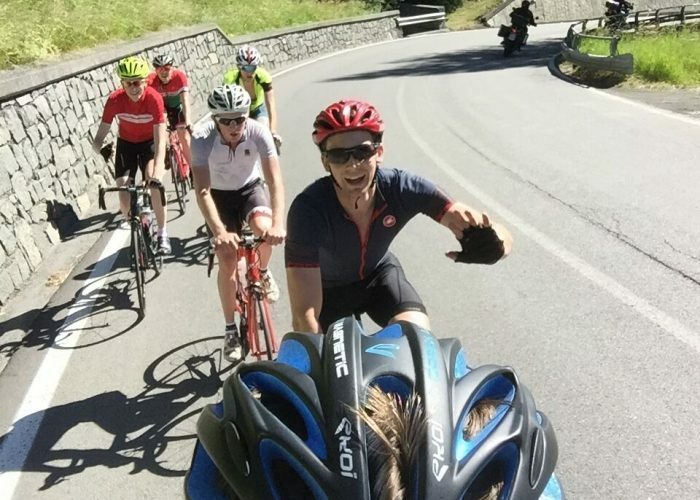 The plan was to do one of the easiest sides of the Mortirolo and then take in the panoramic views along a ridge before descending. 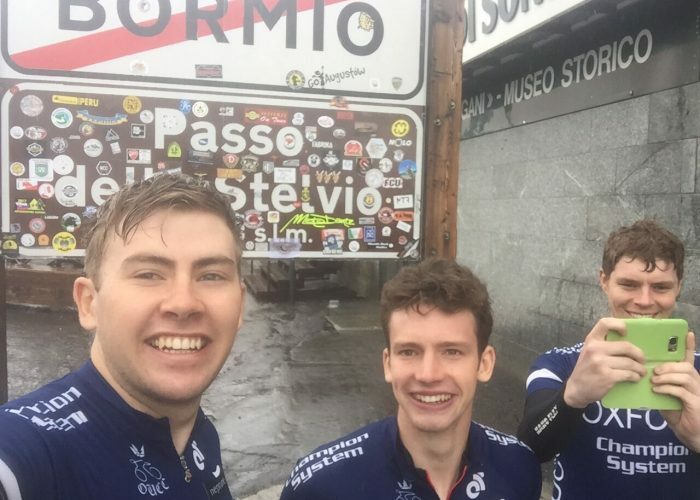 The Mortirolo was hard, the views were almost non-existent due to the clouds and the descent was damp leading to a few overcooking some of the hairpins. 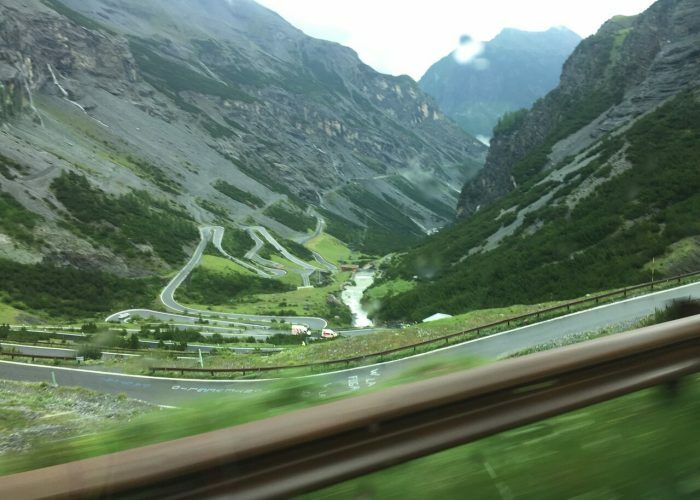 Determined to not let the inclement weather dictate our trip we headed up the Stelvio Pass on the third day. 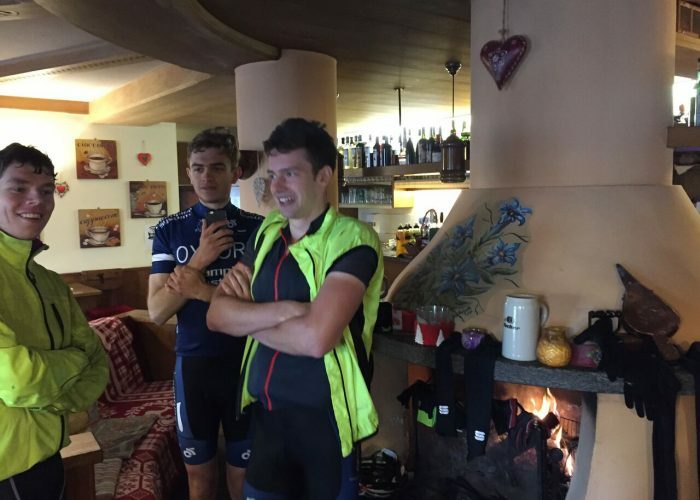 After less than a few kilometres in the rain the thunder and lightning hit, not ideal when riding the second highest paved road in Europe in summer kit. We were in good company though as the Transalp road race was taking on the climb at the same time. Nearing the top, the wind picked up and the temperature decreased. With about 3 km to go, I downshifted and my chain came off and got stuck between my cassette and spokes causing my cranks to jam. In true Matt Stephens (GCN) style, I had a slow motion crash, still fully clipped in. I got up and walked to the next hairpin where I made a feeble attempt at releasing my chain (I blame the cold hands). I ascended one more stretch of road before I came to a junction where a man with a fluorescent jacket shepherded me one way. At the time I didn’t know what was going on but it turned out to be a marshal for the Transalp race and he thought I was a competitor (I suppose I will take that as a compliment). Nevertheless, I was meant to go the other way at the junction. Just around the corner was a stopping point for the race with many team vans and food outside. By this time I was shivering pretty hard so I stopped and tried to see if I could get some shelter under one of the Gazebos. The people who I approached were German. After asking me a few questions, they took me into their van at the side of the road and asked me to strip off my clothes. Although it is not normally recommended to follow such instructions from strangers, given the circumstances I duly complied. The German man then gave me an emergency blanket to cover myself with and some hot broth. I attempted to hold the cup but I ended up spilling it over my legs because of my shivering hand. The man took it upon himself to feed me but I just ended up scolding my mouth. Once I had warmed up sufficiently, they took me to a nearby cafe where I was able to huddle by an open fire. After contact with the others, we decided not to try and brave the weather but instead get a taxi home. 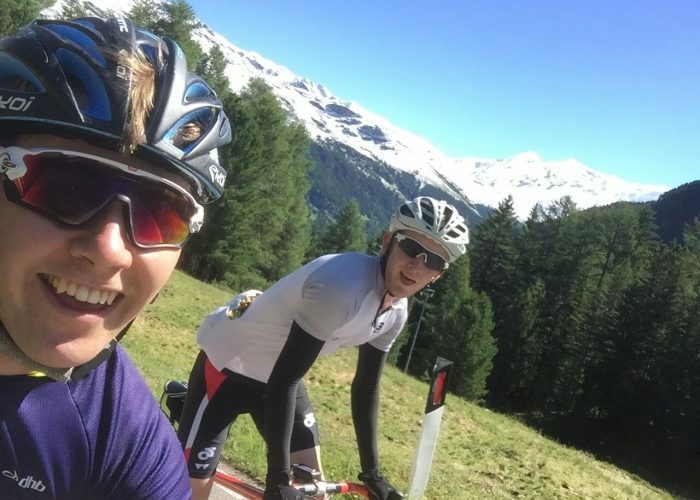 The rest day had arrived so we decided to do it justice taking in 80km and 3,000m of climbing up local climbs…some rest day! 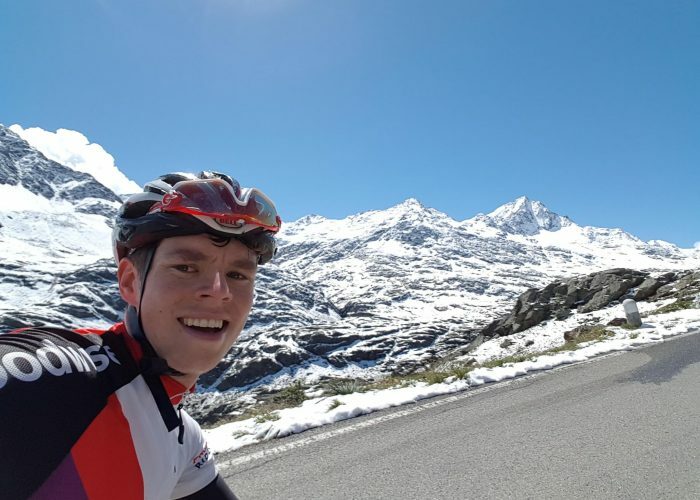 With marginally improved weather day 5 would be a chance to tackle the hard side of the Mortirolo and Sam’s suggestion of the “easier” Monte Padrio (used in the 2012 Giro). 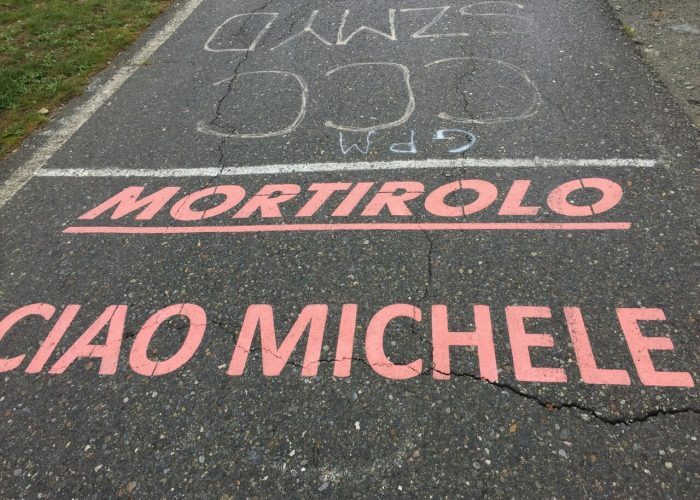 The Mortirolo was better than Lance Armstrong claimed it to be but the Monte Padrio was awful. It has similar averages to the Mortirolo but with steeper kicks and rabid dogs. Tom showed his speed on the steep grades dropping first Mat, then Sam, then Josh. VJ and Joe were up to their usual antics at the front. 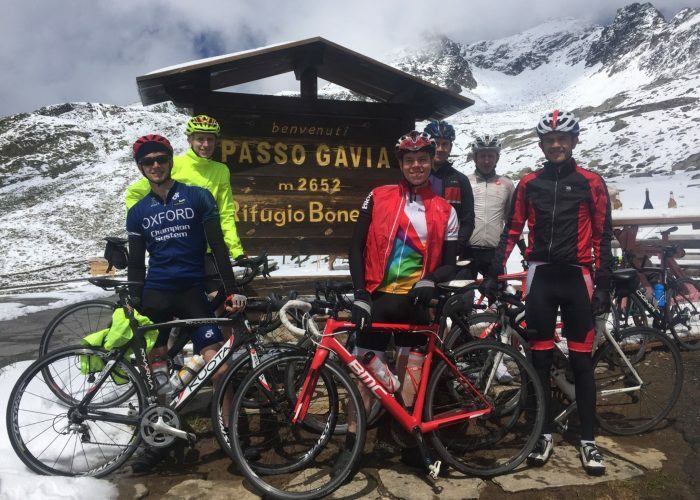 On the sixth day we did the Gavia. Tom’s knees had paid for the effort up the Monte Padrio the day before so he took it easy. The sun was out and the rest of us decided there would be no serious riding today but we took joy in overtaking all the riders on hired Pinarello F10s. There was quite a few inches of snow at the top but the sun made for a great days riding. 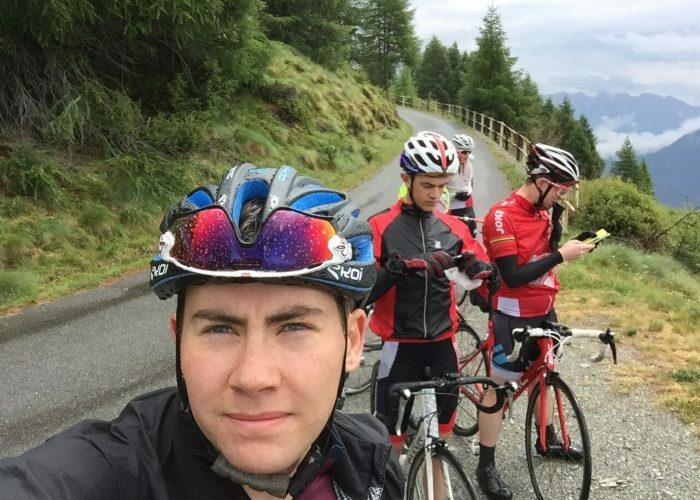 Determined to do the more famous side of the Stelvio and make the most of our final day in Italy Sam suggested we do all three possible routes up Europe’s second highest road. Tom thought we with his bad knee thought it would be best not to come. 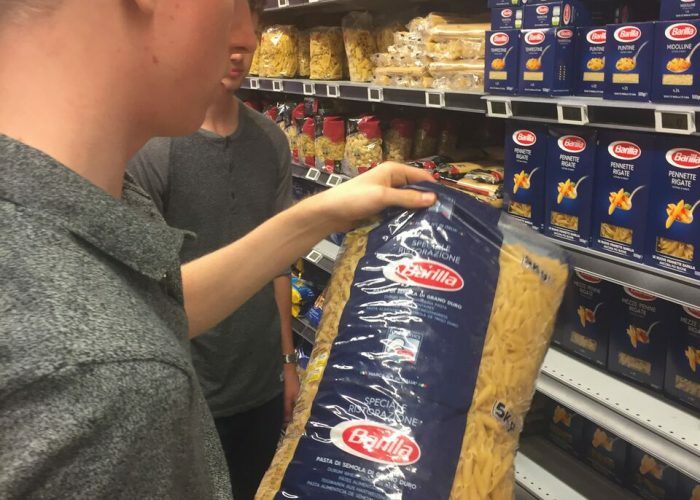 Probably a good choice. We started the ride thinking we wouldn’t make it. Each time at the summit we had different weather ranging from overcast to hail. By the end most were bonking hard but nothing was as sweet as making it to the 2,757m sign one last time. Okay, we didn’t quite Everest it but over 6,000m of elevation and 125km wasn’t bad for our final day. The weather was far from perfect for the trip but everyone did their best to make the most of it. In the end we did almost all the climbs we wanted to and had some of the most memorable rides ever so thank you to everyone who came on the trip. Look out for the training camp in January, chances are we might even get better weather.